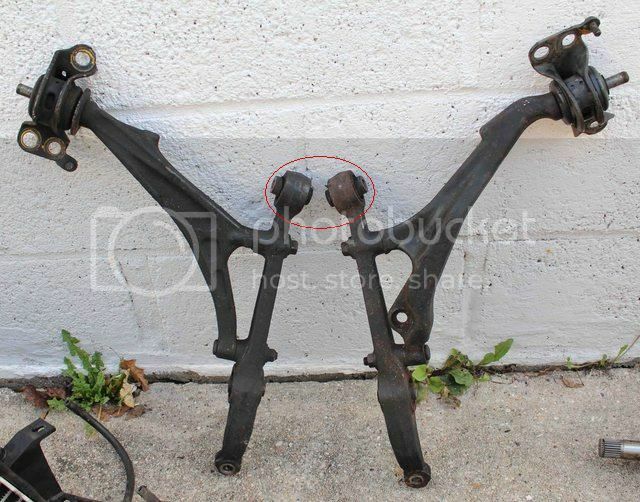 So im gettin ready to swap out the front lower control arms on my 95 civic, but i know theres a certin "bolt/nut" on the most front inner part that a lot of ppl have trouble with. theres a bolt with a welded nut on the back side but the nut is enclosed in the subframe. Ive seen it where the welds on the nut will break and ur screwed.... Has anybody taken these off before? And if so how did u go about getting this nut/bolt combo off? Thanks. Never heard of this being a problem nor had the problem myself. I've removed both of my lower control arms from my EG and had no issues with it at all. I'm also not sure what nut you're talking about. Here I found a picture of some LCA with the brackets still on them for the rear most mount. Could you copy this in MS paint and circle the section you're talking about then re post it on here? Put gear oil on those eBay bushings. Should make it jdm as f*ck!! I'm not even going to bother with repeating myself again. ^^ can't. It's not jdm enough. Dallas, the inner pivot point is the one you are talking about, correct? Not the compliance bushing in the rear. I personally have never had an issue with it either. Rear lca's, now that is a different story. I would personally try and tighten it first, see if it moves, then try and back it out. You can also try and push downwards on the lca, and see if the bushing is frozen. If the sleeve is frozen to the bolt, it will twist in the rubber. Yup. Those are the ones I am talking about. Completely forgot about those being inside the subframe. It's been a long time since I messed with my LCA. There's really no way to prevent it from breaking loose, if it happens then it happens and you'll have to take care of fixing it by either replacing the subframe or cutting into yours, welding the nut back in place, and welding the subframe shut where you cut into it.